Here in Saginaw, Texas many people have told me about what it was like being a kid and having a party phone line. This was a time when people had telephones in their homes but several homes used the same phone line. Each family had a unique ring for their home so that if you heard the phone ring two shorts and one long that was a call for your neighbors but if you hear three shorts then someone was calling your home. Since the party line was open to everyone on the line, you might be having a conversation on the phone but then a neighbor might pick up the phone to make a call only to discover that another family was on the line. 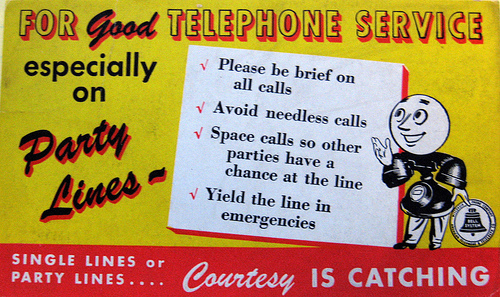 When you lived with a party line there were good chances you heard other's phone calls. I owe Rev. Nancy Allen credit who said, in passing, God calls us on party lines not private lines. When God is calling you for something, God does not just whisper that to you so that only you can hear it. God understands that the world works through the relationships that exist within it. As such when God calls you for something, others will hear/see that call as well. God calls us on a party line not private lines. So if you are trying to discern what God may be calling you for, perhaps it is worth asking others what gifts and graces they see in you. Maybe they have heard something on the line that God called you on.